A pet groomer who claimed she was victimized by other employees because she was deaf, has settled a lawsuit with Petco. Nancy Buchner, who worked at a store in Aurora, Colorado, will be paid $145,000. She has worked as a pet groomer for three decades and communicated primarily by sign language, according to the EEOC. Petco did not acknowledge any wrongdoing in the settlement, but has agreed to give employees training on ADA law. LA Police are offering a $50,000 reward for information leading to the arrest and conviction of the person who shot and killed a basketball coach in South Los Angeles. Eddy Hernandez, who is deaf, coached a team of deaf students at Fairfax High School and was killed by a single gunshot wound. If a Tree Falls is a new book written by Jennifer Rosner who's two daughters were born deaf. Rosner has a Ph.D. in philosophy from Stanford. She discovered a hidden ancestry line of deaf women in her family that can be traced all the way to Europe. 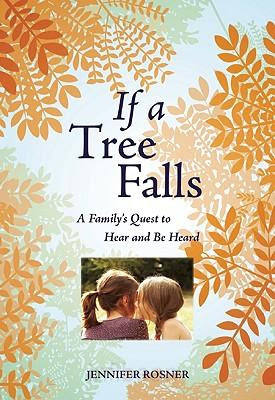 Rosner’s book also details what some would consider controversial decisions she and her husband had to make about surgeries, sign language, and hearing aids. Two deaf great-great aunts of hers lived in the 1800s. Deaf motocross racer Ashley Fiolek finished 2nd in her race at the Thunder Valley Motocross Park in Lakewood, South Carolina this past weekend. The Nineteen-year-old is second overall in the 2010 Women’s Motocross standings, 26 points back of leader Jessica Patterson. Fiolek is a two-time Women’s National Motocross champion despite the fact that she turned pro just two years ago. A new study on users of Nicaraguan Sign Language gives insight into newly adapted languages because NSL is only 30 yeras old. Researchers first noticed that older users of Nicaraguan Sign Language had trouble communicating about right and left. They also had difficulty with navigation. The study suggests some groups may have trouble grasping particular ideas because the concepts are not supported by their language. Details of the study are in the journal Proceedings of the National Academy of Sciences. Read more about the study here. The Times Daily out of Florence, Alabama reports on the Helen Keller festival in Tuscumbia here. Miss Hawaii’s Outstanding Teen is deaf and will become the first deaf person to compete in the national pageant in Orlando from August 24-28. Wailuku 14-year-old Lena Merrill says her platform would be increasing awareness about the need for quality education for deaf children. When Merrill's name was first announced as the winner of the state contest in Hawaii, her interpreter began crying and waving her hands wildly. It took a moment for Merrill to realize she had won. Among her interests: playing volleyball for her school and dancing with a Tahitian group called Tava Nui. A deaf Mexican man is lured into slavery his life is turned around. The The New York Times tells his story here. The San Jose Mercury News tells about a deaf Mexican man who has become a U.S. citizen here. A deaf man in Toronto will go to court today after his arrest yesterday for failing to obey a police commands to stay off the road. Emomotimi Azorbo stepped into the street to cross the road when an officer spotted him and yelled. A friend says the officers kept yelling at him but Azorbo didn't understand what they wanted. They immediately cuffed his hands behind his back, preventing Azorbo from using sign language. Detroit's Carls Foundation is giving $300,000 to the Western Michigan University Department of Speech Pathology and Audiology to help deaf children, especially those with cochlear implants. William Carls was a German immigrant who made his fortune in Detroit's industrial corporations durin the early 20th century. A missing Louisiana woman has been found safe. Miracle Dawn Plunkett was reported missing in Bossier City but the deaf woman turned up in Nacogdoches, Texas where she had traveled on her own. Concerned family members had contacted the police about her after she was last seen Wednesday night. The founder of Maryland's Viable video relay won't go on trial until this fall. John Yeh and Joseph Yeh are accused defrauding the government out of millions of dollars through the FCC's video relay service for the deaf and hard of hearing. They have plead not guilty even though nine other people charged in the case have plead guilty. They face up to 20 years in prison and a fine of $250,000.The Yehs also face a class action lawsuit for failing to pay former employees back wages totaling half a million dollars. The Yehs are asking that the suit be delayed until after resolution of the criminal case. Police are looking for deaf woman in Bossier City, Louisiana. Miracle Dawn Plunkett disappeared Wednesday night after she was dropped off at her home by staff of the Deaf Action Center. Police say there's no evidence of foul play. The bienneal convention of the AG Bell Association is underway in Orlando. It's the 49th meeting that started in 1890. The Alexander Graham Bell Association for the Deaf and Hard of Hearing prootes spoken language among the deaf or hard of hearing. The convention's keynote speaker is Good Morning America contributor Lee Woodruff who is mother to a child with a significant hearing loss. Woodruff's husband, ABC news anchor Bob Woodruff, suffered a traumatic brain injury while covering the war in Iraq. A proposed law that has upset ASL advocates is out of committee in California's Senate. The Human Services Committee approved the bill yesterday. Sponsored by Democrat Tony Mendoza the bill called AB 2072 covers what information should be given to parents of deaf infants. Critics suggest it will push "oralist" treatments on deaf children. Groups opposing the measure include The California Deaf Newborn Identification & Advocacy Stakeholder Coalition American Society for Deaf Children, and California Association of the Deaf. They say it would discourage teaching ASL early and that supporters are largely for-profit companies with a financial stake in the outcome. A brochure to be distributed to parents is published by manufacturers and vendors of implants. The group also objects to the place given in the bill to audiologists, who would serve as first providers of information to parents of newly identified deaf children. Advocates say the bill simply requires hospitals to discuss all options with parents so they may make an informed decision. A committee report on the bill is posted here. The Vermont Center for the Deaf and Hard of Hearing holds its 11th Annual Golf Tournament tomorrow in Brattleboro, Vermont. Click here for more information. A recap of the US World Cup game against Algeria is offered in International Sign here. The FCC has issued a stern reminder to video distributors to make emergency information accessible to the deaf, especially with hurricane season upon us. The warning went to satellite providers, cable systems, and TV stations. These media companies must use closed captioning or a similar method. There also must be a way established by the video provider for viewers to lodge complaints when the information has not been properly provided. A deaf teenager is safe after disappearing last night. 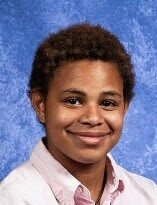 Police near St. Louis say the 17-year-old went missing until being found today in the suburb of Ladue. Authorities are not saying why Clarence Johnson disappeared or his condition. He mother says he was on his way home from baseball practice and the family began receiving threatening text messages from Johnson's phone soon after his disappearance. Another study shows iPods can cause hearing damage. Portable music devices can cause temporary hearing loss, according to researchers at the Ghent University in Ghent. Details are in the June issue of the Archives of Otolaryngology-Head & Neck Surgery. A Gallaudet faculty member has been selected as a White House fellow. She will work with top White House staff members for a year. Only 13 are picked for the honor. Dr. Rashid has been a member of the Gallaudet faculty since 1994, including a stint as Chair of the Department of Business. She has served on the board of the World Deaf Leadership Program and has served Board of the Maryland School for the Deaf. Ear tubes apparently don't create problems for children who are given cochlear implants. Researchers say myringotomy tubes can be managed like tubes in other children who are prone toward complications. The University of Alabama at Birmingham Medical School looked at information from 62 children and discovered tympanic membranes from which tubes were removed before or during the implant healed. There were no cases of meningitis or implant removals because of infection. Details are in the Archives of Otolaryngology -- Head & Neck Surgery. Mountain2Mountain is building a school for deaf children in Afghanistan. The Afghan government is donating 5 acres for the project that could be completed this summer. The school will teach as many as 1000 students - although the country has no formal sign language. The Denver-based group is working on a version of sign language based on spoken Afghan languages and international sign language. Some $300,000 of materials are being donated by Miami's InnoVida Holdings and Denver's International Home Finance and Development are donating. Quality Management Construction of Afghanistan, is providing construction management services at a discounted rate. Mountain2Mountain still needs to raise another $400,000 for construction. Read more about the project here. Here is a video report on the deaf high school pitcher we told you about who led his Michigan team to a division crown. Watch the story from WNEM-TV in Flint here. The annual Helen Keller Festival is underway in Tuscumbia, Alabama. The festival includes food, art, and music until next Tuesday. There is more information here. An Athens, Georgia deaf teacher is profiled here. Many major video sites do not provide captioning including the TV shows on CBS.com, news clips at CNN.com and entertainment at MSN.com. Websites like NBC.com and Hulu.com provide it for some shows, but not others. Congress mandated in 1996 that most television shows must provide captioning, but no such rule exists for video on the Internet. In May, the Senate held hearings on the possibility of creating such a law. Meanwhile, industry groups are working to create a standard for online captions, before the government steps in. Google has pushed the ball forward by creating software that automatically captions video. Sites like Netflix is in the process of captioning its movie and TV streams while CBS says it is working on its own captioning program which will be out by the end of the year. A deaf pitcher pitched his Michigan high school team to a championship this weekend. Junior right-hander Brandon Holsworth threw 5 2/3 innings scoreless innings for Beal City High from Mount Pleasent, Michigan against St. Joseph Lake Michigan Catholic. He allowed four hits on eight strikeouts and no walks. His team won the game five to nothing to earn the Division 4 baseball crown . Holsworth had 8 wins against 2 losses for the season. An article about ASL classes taught by a deaf instructor at Springhill College in Mobile, Alabama is here. Deaf ultimate fighter Matt Hamill battled burred vision, a broken hand and a staph infection to win his Las Vegas match against Keith Jardine. Hamill earned a majority decision win at The Ultimate Fighter 11 Finale last night. on Saturday. Hamill now has 10 wins against 2 defeats but nearly lost as he was finishing his opponent because Jardine inadvertently poked him in the eye during the second round. He was already thrown off by breaking his left hand by throwing a punch that hit the top of Jardine’s head. Hamill win gives him 4 in a row and a $25,000 bonus for Fight of the Night. A deaf man was hit by a car in Washington County near Pittsburgh yesterday. He was crossing from the southbound lanes to the northbound lanes on South Route 837. He was not named but is over 60 years old. The driver was about the same age. A Knoxville group will offer Christian music in ASL with voice interpretation this coming Friday at Faith Promise Church. The event is sponsored by Sign Art Ministry includes the performance group Vision of Hands which is a ministry of Blountville's Celebration Church and the pastor of Tampa's Grace Bible Deaf Church. He'll present a workshop on signing music the next day. Voice interpretation will be provided for the sign language impaired. For more information click here. The US soccer team tied Slovenia 2-2 in World Cup play yesterday. A report in international sign is here. Deaf visitors to Disneyland's parks will no longer have to call ahead to request sign language interpreters. For the first time, the company is assigning interpreters at eight locations starting. Deaf visitors are asked to pick up schedules when they arrive at the parks and find out when the interpreters will be on duty. The parks already offer devices for amplified audio and captioning are also available. The Rhode Island education commissioner plans to recommend that the Rhode Island School for the Deaf be given back to the Board of Trustees. Last year, she asked the state Board of Regents to let the state Department of Education take over because of concerns over academic concerns. But now she believes the trustees have been working productively. The Regents will consider the request at their next meeting. The first federal rules based on ADA law have been issued for cruise ships,fishing charters and dinner cruise boats. The new Department of Transportation directive prohibits vessel operators from charging extra for accessibility-related services, prevent boats and ships from requiring passengers to furnish their own attendants and prevent boat operators from denying passengers access based on disability. These rules appy to both to public ferry systems and vessels operated by private companies. Operators must provide information about the accessibility of their facilities and services and make someone available to address accessibility concerns. The 2nd Annual Bluegrass Cup disc golf tournament takes place Friday and Saturday in Burlington, Kentucky. There's more information here. Deaflympics 2011 may not take place in Slovakia as planned. Here's a message from the president of the organization about where things stand with the Winter games. Here is a video message about plans for Deaflympics 2013 set for Greece. WFOR-TV in Miami tells how one deaf newborn is doing here. A lunch & learn gathering on cancer will be held in Fort Smith, Arkansas this Saturday morning. It's the first event for deaf women sponsored by the Donald W. Reynolds Cancer Support House. The event will cover cancer awareness and preventative education. An interpreter will be provided and videos will be open-captioned. SpeechGear is offering a software package that lets users to type words and have them read aloud by the computer. The software also picks up what is being verbally said by others and immediately translates it into text for the user to read on the computer screen. The software, called Interact-AS costs $795. The company hopes it will allow people who are deaf or hard of hearing to better communicate with people who may not know sign language. The product is available through Harris Communications. Several hundred copies of Interact-AS have already been sold. Learn more about it here. The California Deaf Newborn Identification & Advocacy Stakeholder Coalition will hold a rally this morning at the state Capitol. The 10am rally is intended to voice opposition to a bill which will be heard by a committee today about what information to give parents of deaf newborns. Read more about the bill in an earlier post here. The Southwest Softball Association of the Deaf holds its regional slo-pitck softball tournament starting tomorrow in Gulfport, Mississippi and goes through Saturday. There is more information here. WMAR-TV in Baltimore interviews Casey Davis who started DeafMD.org. Davis is a finalist to represent Baltimore fans at the Major League All-Star Game. North Carolina law now requires that any state health plan cover hearing aids for anyone up to age 21. This includes replacements, hearing aid evaluation, fitting and adjustments, and supplies. Insurers will have to pay up to $2,500 per ear for hearing aids every three years for children up to 21 years of age. Third-grader Collin Tastet of Greensboro led the lobbying effort. He has worn hearing aids since he was a baby. Police in Washington, DC's have agreed to let Purple Communications start a video relay pilot program. The VRS software has been added to more than a dozen squad cars and installed in seven detectives' offices and in six specialized units including homicide and youth investigations. A New Jersey deaf man has admitted he killed a woman he was trying to rob. Dontay Milbourne entered a guilty plea to aggravated manslaughter and will be sentenced in August. Prosecuters have agrred to a deal that would have him serve 17 years in state prison. The victim was Jackie Foreman who was killed in 2006 at her apartment in a housing complex for people who are young and disabled. The 31st annual Mike Glenn Basketball Camp for the Hearing Impaired takes place Sunday in Decatur, Georgia. Player from around the country will gather for the week long event to sharpen their skills. It is a tribute to Charles Glenn, the first basketball coach at the Georgia School for the Deaf. On Friday night, June 25, there will be an admission free all-star game at the Decatur Recreation Center in downtown Decatur. There is more information here. World Cup organizers are getting complaints about the horns used during games by South African fans. The trumpet-shaped "vuvuzela" is a cheap plastic noise-maker that makes a loud sound comparable to a huge swarm of bees. They are loud enough to be heard on the television broadcast of the games. Some teams say the toys are affecting play on the field and they can be loud enough to cause hearing loss. The vuvuzelas can emit an ear piercing noise of 127 decibels which is louder than a lawnmower at 90 decibels or a chainsaw at 100 decibels, according to the Royal National Institute for Deaf People. So far, FIFA officials say the horns will not be banned. We told you Friday about a group of deaf patients who are suing a Jacksonville hospital. Here's a video report on the suit from WTEV-TV. Read the Friday story here. The Hearing Loss Association of American holds its annual convention starting this Thursday in Milwaukee, Wisconsin. For more information, click here. When someone with average hearing and sight gets conflicting information through each sense which one does the brain trust? Researchers say if you have people count the number of times a light flashes while listening to beeping tones, they’ll assume the light flickered as many times as the beeping occurred – even when they are not the same number. When it’s an issue of timing and the brain has to make sense of similar information delivered in a sequence, the brain counts on hearing. A new book is out called Deadly Charm: The Story of a Deaf Serial Killer. 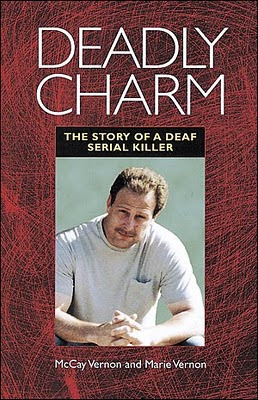 McCay and Marie Vernon write about Patrick McCullough who shot himself and his girlfriend a decade ago after years in and out of prison for other crimes. He struggled with drug and alcohol abuse combined with a violent temper. The Vernons say he used his good looks and charms to draw people to himself, especially women. Read more about the book here. Here is a report from the World Cup in International Sign about the US-England match yesterday. Click here. This link will take you to an ASL report on the World Cup Match between Mexico and South Africa. Click here. A Postal Service carrier was fired for losing a key that opened every one of her customer's mailboxes. She did not hear her key drop while on her route because of a her profound hearing loss, something she noted on her employment application. The key was later discovered and turned in by a customer. Was this a violation of ADA law? No, because there was no "reasonable accommodation" required of the employer. This is typically considered the legel test as to whether the Americans with Disabilities Act has been violated or not. For a long time, nearly everyone on Martha's Vineyard used a distinctive sign language. The island off the coast of Massachusetts used this unique form of communication from the middle of the 17th century to roughly the turn of the 20th. But by the mid-1960’s, signing on the island had ceased, since the last deaf person living there had died. A deaf teenager has died from injuries she sustained when she was hit by a car at the Indiana School for the Deaf. Both 15-year-old Dawn Carter and her mother were hit while raising money for the school where the girl was a student. Derek Dewitt was arrested for plowing the car into them. Dewitt blames not taking his schizophrenia medication. The girl had been in a coma since the accident. The school is accepting donations for the family here. A Boston-area man is facing charges for leaving three deaf adults in a van on a hot day while he mowed his lawn. WFXT-TV has this video report. The 7th Annual Deaf Asia Festival takes place tomorrow in Los Angeles from 9am to 5pm. There will be food, games, exhibits, comedy shows and more. It takes place on South San Pedro Street between 2nd and 3rd streets in Little Tokyo. For more information, click here. Seven deaf patients are suing a Jacksonville hospital over its lack of interpreters. Seven patients say Baptist Health violated the Americans with Disabilities Act. One says, instead of getting an interpreter, nurses gave her a stuffed monkey. Another says she was told the hospital staff lost a list of sign-language interpreters given to them by the patient's mother. The hospital says it has not seen the legal complaint and cannot comment yet, but plans a series of forums this summer about communicating with patients. There are at five interpreting services in the area along with the Florida School for the Deaf and the Blind in St. Augustine. The softball team at the Maryland School for the Deaf are national champions. The National Deaf Interscholastic Athletic Association picked the team for the second time in three years. The Orioles completed their season with 14 wins, 5 losses and one tie. On top of that, they won the national deaf tournament in Texas. Head coach Mathis Hediger was picked as the Coach of the Year and junior Claire Tucker was selected as the Player of the Year. The school also holds the national title this year for wrestling, basketball (both girls and boys), football and volleyball. Zachary Johnson is the first deaf graduate from the Riverside City College from the school's Interpreter Preparation Program. He just finished a 92-hour practicum that included working with hearing interpreters at a CPR-certification conference in San Diego. The 31-year-old attended college in Ohio and Gallaudet University in Washington while his parents attended the California School for the Deaf. Johnson next wants to earn his associate's degree in American Sign Language and then a bachelor's degree in linguistics, become a certified deaf interpreter and teach at a community college. Rear Window is device operates pretty much the same way that closed captioning works on TV programs. It allows movie theaters to displays captions of a film's dialogue on a panel that is generally attached to a seat or a floor stand. Here's a list of theaters offering the Rear Window system. Another way to help the deaf at theaters is the use of a second audio channel on the film to describe the action on the screen. The channel is blocked from running through the auditorium speakers but is broadcast just to those who have specially equipped headsets. Another approach is called open captioning. It puts the captions directly on the movie screen. The new documentary about comedian Joan Rivers includes a scene where she tells a crude joke about Helen Keller. While appearing at a Wisconsin casino, a man in the audience challenges her about a mean-spirited Helen Keller joke. He yells, "It's not funny if you have a deaf son!" Rivers shouts him down, arguing that comedy is about making us able to face the most painful and awful aspects of life. Joan Rivers: A Piece of Work opens in select cities later this month. The world's largest festival of artists with disabilities is underway in Washington, DC. The International VSA Festival runs through June 12th, drawing more than 600 artists, performers and educators from around the world, including students from every state who competed to have their work shown at Washington's Union Station. Hosted by the Kennedy Center for the Performing Arts, the festival takes place at sites across the nation's capital. There are free daily performances, films and visual arts. The festival coincides with the 20th anniversary of the Americans With Disabilities Act. Cochlear Americas has agreed to pay $880,000 to settle accusations it paid off doctors and health care providers to push its cochlear implant systems for Medicare and Medicaid patients. The decision is the outcome of a lawsuit that started back in 2004, filed in Colorado. Cochlear Americas is a subsidiary of Coclear Limited, an Australian company. A Justice Department spokesman said, "Today's actions demonstrate that the United States will not tolerate the payment of kickbacks by any entity involved in providing medical goods and services to beneficiaries of federal health care programs." A New Jersey couple says their daughter's school is threatening to suspend her if she uses sign language on the school bus. Danica Lesko and her parents say sign language is the only way to for the 12-year-old to communicate, but Stonybrook School in Branchburg calls ASL a safety hazard. A letter to the Lesko family demands the child stop signing or face a three-day suspension. The Leskos say students mocking Danica and her signing friends were disruptive on the bus, but she is being punished. There is also concern that the school district may be relatiating against the family because they filed a lawsuit for a bottle rocket being shot near Danica's ear last year at school. That's when she began losing her hearing. About 41,000 people work as sign language interpreters and translators. The field is projected to grow 25% by 2016. See What I'm Saying will be shown at Gallaudet University tonight, Friday night and Saturday night with both matinee and evening performances. The movie follows several deaf performers and is in ASL and English, with open captions for signers and non-signers. It will also be shown at Washington's International Disability Film Festival. Part of the ticket sales will go to Friends of Deaf Haitians to help with the relief effort following the January earthquake that devastated the country. A special reception at 9pm on Saturday will honor the film's director and each of the film's performers. 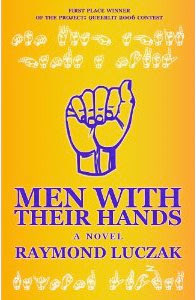 Raymond Luczak's new novel tells the stories of a number of deaf gay men over a period of 15 years. The 258 page Men with their Hands mostly follows Michael, who hears with the help of powerful hearing aids. His family is ashamed of him for being deaf. They refuse to let him use sign, insisting that he try to be “normal”. Michael meets other deaf students who are proud of their ability to talk with their hands, and they teach him not only to sign, but to be proud of himself. He learns that talking hands are a thing of wonder and great beauty. For more information click here. Another way to help theater-goers with hearing loss is the use of a second audio channel on the film to describe the action on the screen. The channel is blocked from running through the auditorium speakers but is broadcast just to those who have specially equipped headsets. A new Apple application called FaceTime lets iPhone 4 owneres talk with one another using video chat. Apple says it will allow people to communcation through sign lanuage on the device, provided they are on a WiFi. The service can use either the iPhone 4's forward facing camera, or its 5 megapixel rear one. It will launch with the new phone on June 24th. You can test yourself online to see if you have “tune deafness”. A study says as much as 2% of the population may have it. It’s the inability to distinguish a melody from traffic noise, despite having normal hearing. Researchers at the National Institutes of Health say brain waves show that the tune deaf cannot tell a right note from a wrong one. Details of the study are in the online journal PLoS One. A congressional committee will hear testimony Thursday on a bill that would bring closed captioning to internet video. Massachusetts Congressman Ed Markey introduced the 21st Century Communications and Video Accessibility Act. Sites like Netflix and iTunes are not required to carry closed captioning, but if the proposed law is passed, there would be a standard required for large internet video services in the US along with smart phones and other portable devices that display video. The bill, known as H.R. 3101, would not affect user-based sites like YouTube. The bill also calls for funding of research into real-time texting that would apply to cell phone communication. There are six lawmakers sponsoring the legislation. It’s been endorsed by AT&T along with Verizon. The hearing takes place at 10am in the Rayburn Building. A spokesperson for Hearing Loss Association of America is expected to speak, along with a US Army veteran, blinded while serving in Iraq. • 31% of the courts were outfitted with assisted listening devices. • In areas with more than half a million people, the number that provided interpreters rose to 88%. Ryan Ketchner is getting closer to the Major Leagues. The deaf pitcher plays for the Triple-A farm club of the Detroit Tigers, the Toledo Mud Hens. He pitched six shutout innings in last night's game against the Rochester Red Wings to earn the win. Ketchner is now 2-2 on the year with a 2.83 ERA. The 28 year old is playing for his 4th baseball organization since turning pro in 2000. A Minnesota discrimination lawsuit will head to trial after a federal judge refused to issue an immediate ruling as requested by the Hibbing Taconite company. James Edstrom accuses the company of denying him employment at its mine because he is deaf. The judge says there is enough evidence to suggest the claim should be hear. Hibbing Taconite says Estrom isn't qualified and his deafness could put others at risk, but he had already gotten experience working at another mining company. An assisted living facility in Lincoln, Nebraska rejected a temporary worker because she was deaf, according to a lawsuit filed today. The EEOC says Haven Manor violated ADA law when it refused the placement of certified nursing assistant Amanda Huff. Staffing agency Willingham Health Services sent Huff to Haven Manor in the fall of 2007 to cover an evening shift but she was sent home because of her hearing loss. The Gallaudet School for the Deaf in St. Louis is closing to save money. Its 69 students will be mainstreamed. The school has been in operation since 1927. A fire at the Indiana School for the Deaf caused $100,000 in damage. It started in a dormitory snack bar yesterday afternoon. It may have been started by a small refrigerator that shorted out. Some 50 students live in the dorm building. No injuries were reported. The second annual Rochester Deaf Festival takes place tomorrow at Ellison Park in Rochester, New York. Food will be served and admission is free. The event drew more than 700 people last year. Video reports from the World Cup will be broadcast in International Sign at FIFA's official website when competition begins on June 11 in South Africa. All 64 matches will offer International Sign (also known as IS). It has been used at events like the Deaflympics. The report videos will be FIFA.com soon after each game. The International Disability Film Festival starts Monday in Washington, DC with See What I'm Saying: The Deaf Entertainers Documentary. The movie follows the lives of deaf comics and singers for a year. The director Hilari Scarl will lead a discussion afterward. The Learning Center for the Deaf in Boston will build a a 20,000-square-foot early-childhood center and library for the deaf and hard-of-hearing. The day and residential school sold $3.6 million in bonds for the project. The new facilities will sit apart from the 17 existing buildings on the 12 acre campus. The Learning Center has a smaller satellite school in Randolph, Massachusetts. The school serves more than 200 students ranging from elementary-through-high school grades. When the play Children of a Lesser God first debuted in London, interpreters were employed to translate the American Sign Language from the actors on the stage to British Sign Language for the deaf members of the audience since the two systems are different. The play tells the story of a deaf woman who falls in love with a hearing teacher at a school for the deaf. A St. Louis community is giving away fire alarms that shake beds when activated. The Fireman's Fund Insurance company has given the West Overland fire district a $1500 grant for the devices. KPLR-TV in St. Louis has this video report. The Scripps National Spelling Bee starts tomorrow in Washington. The first profoundly deaf speller to compete at the national level was Jimmy McCarthy of St. Petersburg, Florida. In 1996, he tied for 48th place in the field of 247 spellers. Daryn Miller is the first deaf driver to win a race at Riverhead Raceway on Long Island, New York. The 36 year old won the Chargers race Saturday night. He's been racing for seven years and communicates with his crew through a series of four colored lights. In his day job, Miller owns a landscaping company. Coming into Saturday's race, he ranked 11th for Late Models and 13th in the standards for Chargers.